The clock is ticking. Summer will soon be over. 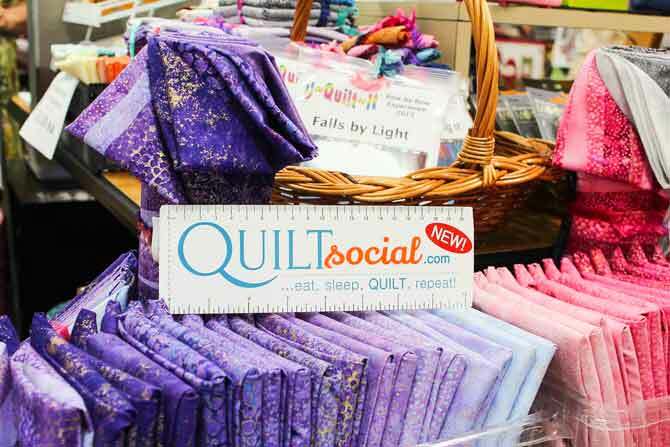 But first – here are 4 more exciting things to do in our 50 ways to keep a quilter happy while on vacation countdown! The best part is that many of these activities can be done at any time of the year. Most guilds have their meetings from September to June. However some guilds have meetings and work sessions right through the entire year. I was fortunate enough to visit the River’s Edge Quilt Guild in North Battleford, Saskatchewan. Not only do they have a fabulous space to hold their meetings and work in, but they have three sewing days a week. Now that’s a guild you want to belong to! 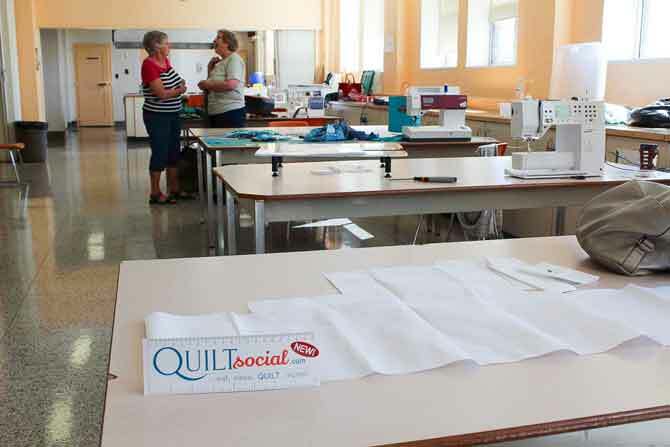 The one thing about quilters – we all have something in common. 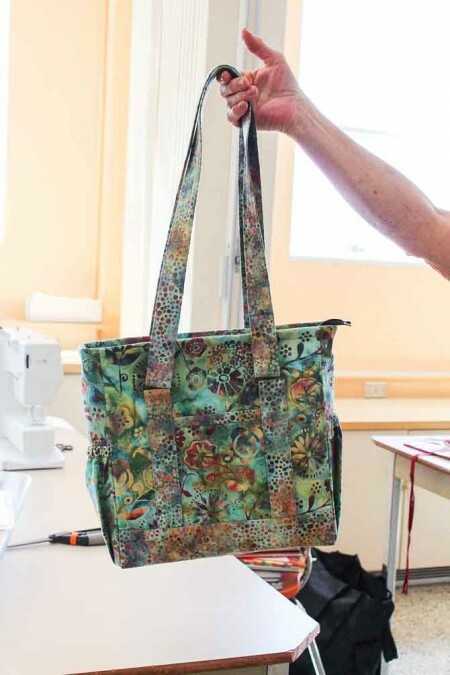 We love to sew and we’re very quirky! Well most of us are anyway. As I was having afternoon break with the group, they quizzed me on what was the hot trend here. I thought for a moment and said “bags”. Well turns out they had just hosted a bag class. I noticed a piece of a project that one guild member had in her hands and asked if that was the “professional tote?” “Yes” was the reply. I laughed because I had recently taught this very bag. A great discussion ensued on the merits of the construction methods and materials used. We had a blast comparing notes. This newspaper style guide is for quilters. Actually it’s a travel guide to Specialty Shopping and Events across the local region – usually by state or province. (British Columbia, Alberta, Manitoba/Saskatchewan and the lower 48 states). 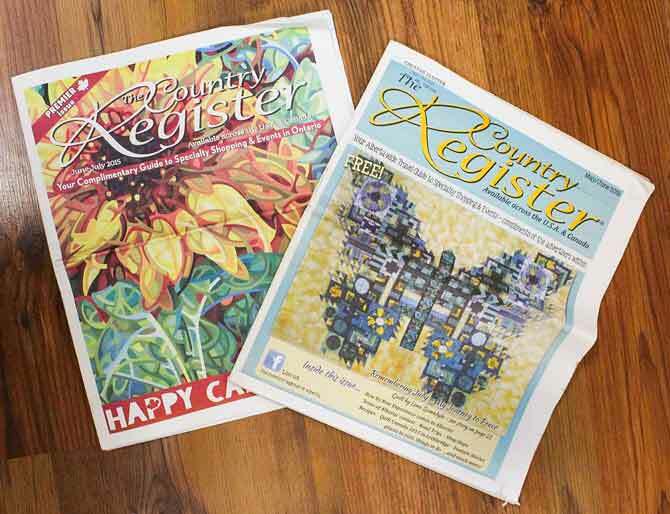 The Country Register is a great way to find out what’s happening in the area you’re visiting. You can usually pick up a copy in quilt stores, welcome centers and other locations. In addition, there are some great articles as well as contact information for local guilds. I also spotted listings for workshops, quilting services, museum exhibits, quilt shows and much much more. 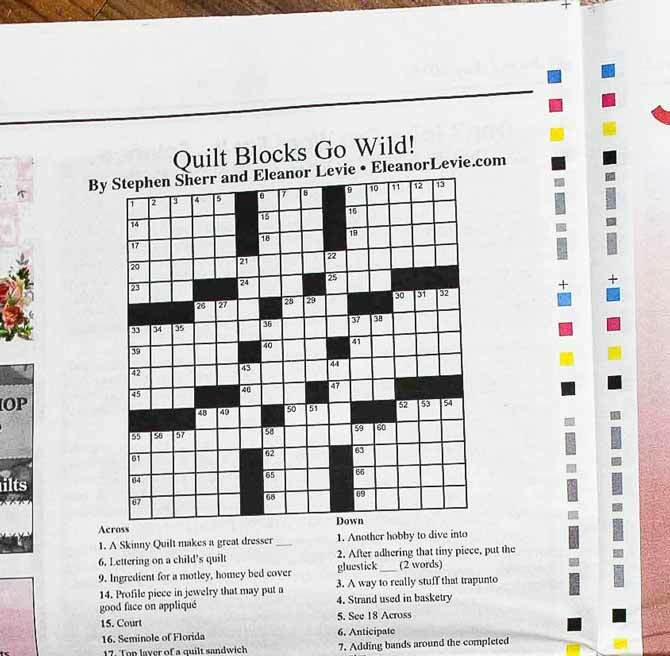 There was even a quilt themed crossword in one of the editions I picked up. 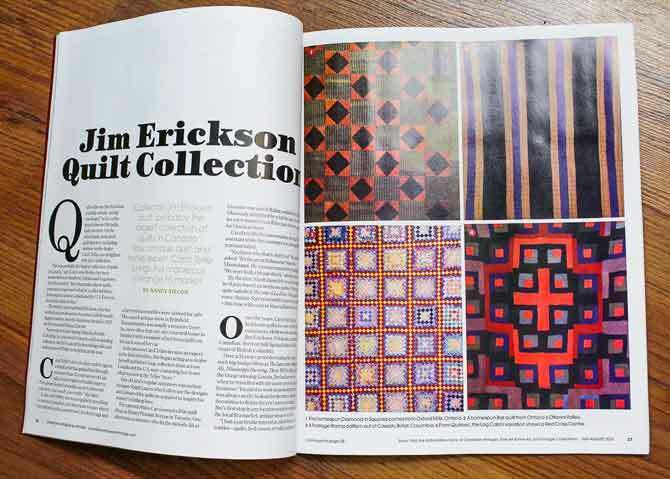 I had heard about Jim Erickson’s quilt collection last year. 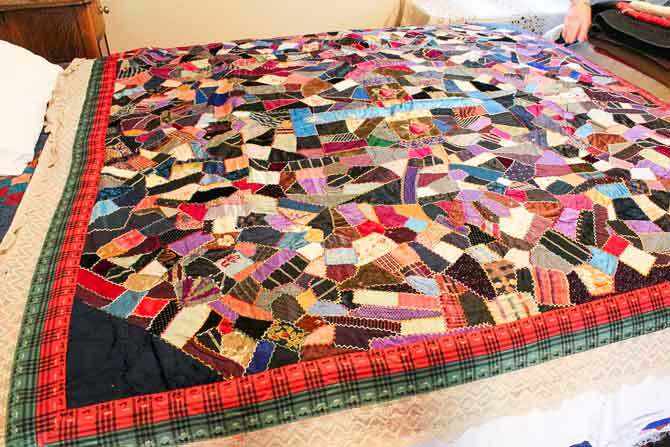 He has amassed almost 260 pre-1950’s quilts and coverlets from the US and Canada. I was able to contact Jim through a family member and made arrangements to visit him at his home. We were able to view a very small part of the collection and listen to Jim’s wonderful stories as he showed us the quilts. He’s an extremely knowledgeable collector and has even made a couple of quilts himself – all by hand! What a thrill to view some of these treasured heritage quilts. Jim’s collection is featured in the July/August issue of Canadian Antiques & Vintage. No summer trip would be complete without a visit to a local quilt shop. 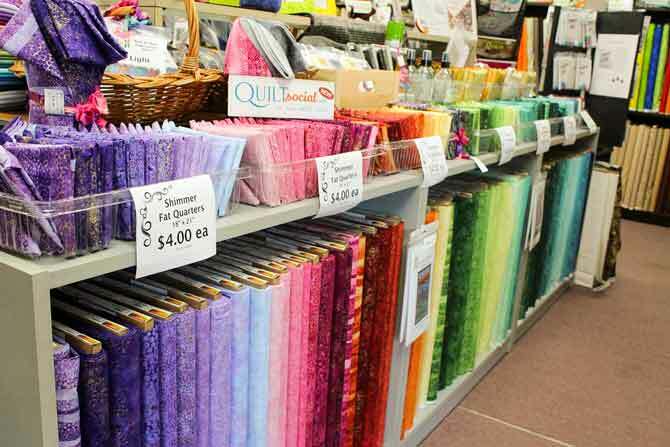 Well make that shops with an S.
Today’s quilt shop is U-Quilt-It located in Smithville, Ontario. It’s a fairly new shop with some amazing fabrics and great displays. Fabulous range of colors and values – bargello quilt anyone? Wasn’t that exciting! 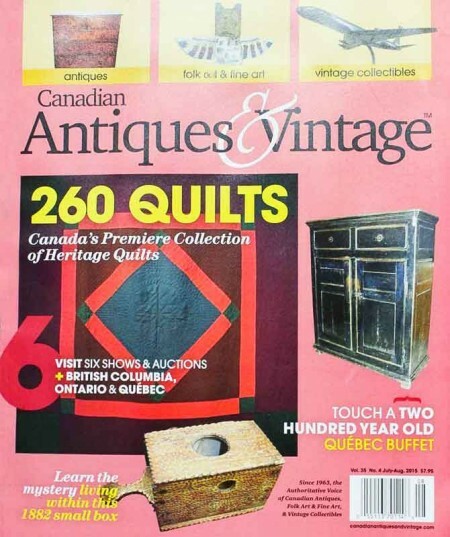 There’s still time to sneak one or two more day trips, certainly these editions of the 50 way to keep a quilter happy while on vacation has given much food for thought, and dreaming… Don’t forget to send in your quilty ideas of things to do. Have a great day! Ciao! 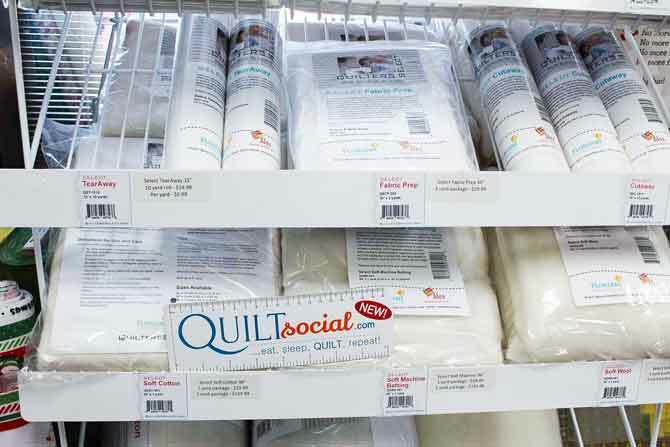 See all the articles in our “50 ways to keep a quilter happy while on vacation…” series!